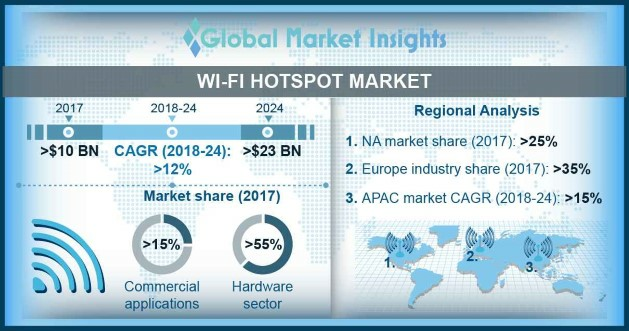 Wi-Fi Hotspot Market size is estimated to exceed USD 23 billion by 2024; according to a new research report by Global Market Insights, Inc. The limited frequency range of the Wi-Fi hotspot technology is restraining the wi-fi hotspot market growth. Inherent limitations associated with the range and multipath interference of the Wi-Fi technology restrict user mobility. The radio frequency signals of Wi-Fi hotspots are subject to the limitations posed by structural properties of a hotspot location. The radio frequency of a typical Wi-Fi hotspot device cannot reach beyond 20 to 25 meters. The commercial application segment is anticipated to register a high growth rate in the wi-fi hotspot market over the projected time. The retail market is expected to grow rapidly due to the widespread adoption of Wi-Fi hotspot services at retail establishments. The retailers are using Wi-Fi-assisted technologies such as the IoT, mobile applications, and POS systems to predict their customer behavior and create a more personalized experience. The residential market is expected to grow due to the increasing data traffic caused by the rising consumption of rich media content. Moreover, the growing disposable income of consumers is also driving the residential market. The players operating in the wi-fi hotspot market are Ipass, Aruba Networks, Nokia Networks, Ruckus Wireless, Alcatel-Lucent, Aptilo Networks, Motorola Solutions, Cisco Systems, Netgear, Ericsson, Boingo Wireless, and Ubiquiti Networks. The companies are focused on entering into strategic partnerships with other vendors to strengthen their product capabilities and increase their customer base. For instance, in 2017, Ruckus Networks launched its Technology Ecosystem Partner Program to offer complete and proven solutions for network application needed to complement its Wi-Fi hotspot portfolio and help customers meet critical business needs.